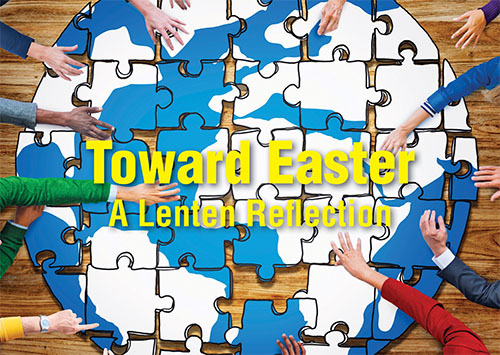 For the 2016 Lent season, we have produced a FREE pocket-sized Lenten reflections booklet called Toward Easter: A Lenten Reflection. The booklet is not specific to the year 2016, and will still be available for future years, until stocks run out. Based on the Biblical theme of shalom, the booklet is our gift to you, inviting you into your own journey of reflection on the Lenten road to Easter. Lent is traditionally a time to prepare for Easter in remembrance of the life, death and resurrection of Jesus. Scripture defines these events as signifying the defeat of evil and death, and as pointing to the new order, or shalom, that Jesus has brought the world. But what does shalom really mean? Our hope is that this booklet helps you reflect on the journey of Lent and the promise of Easter and how the Biblical principle of shalom invites us to take steps to heal our broken relationships with God, ourselves, others and God’s creation. You can order one copy for yourself, or multiple copies for your church, family, friends or community group. To make an order, contact us on aoa@anglicanoverseasaid.org.au or 1800 249 880. You can also download a pdf of the booklet here.